Hi everyone- if you could quickly pop over and vote for me, I would REALLY appreciate it. No registering or loggin in. Just one thumbs up click! You can vote once per day. Thanks. Donuts are one of my most favorite treats! I love them all- old fashioned, crumb, twist - yummy. 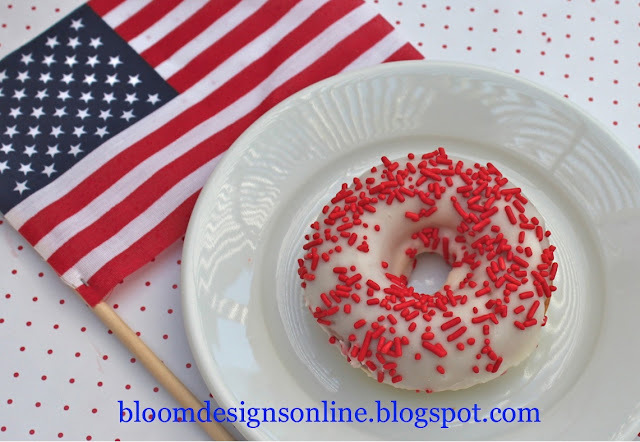 When I saw a recipe for homemade donuts on Bakers Royale, I knew right away that I had to try them and what better time than Memorial Day. My family and I always head out early to our watch our town's Memorial Day Parade. 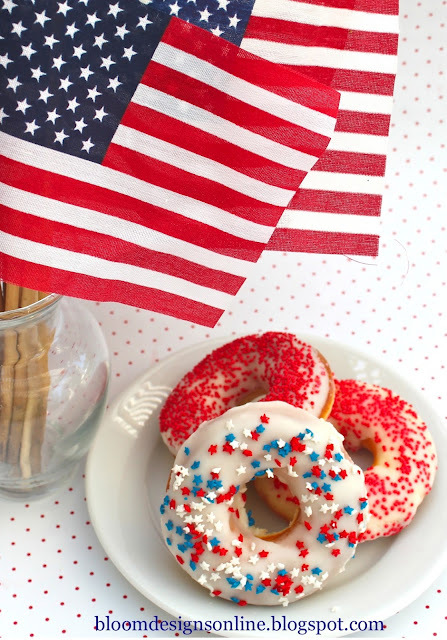 Topped with patriotic red, white and blue stars, these donuts are the perfect way to start our patriotic celebration. I altered the donut recipe slight and came up with my go to glaze. 2. Mix together sugar and lemon zest- set aside. 3. Sift together flour, baking powder, and salt. Stir in sugar mixture. 4. Add in the rest of the ingredients and stir until combined. 5. Put batter into piping bag. 6. Fill donut pan half full. 7. Bake for about 6 minutes. Donuts will be light on top and darker on bottom- I couldn't find a way around it. 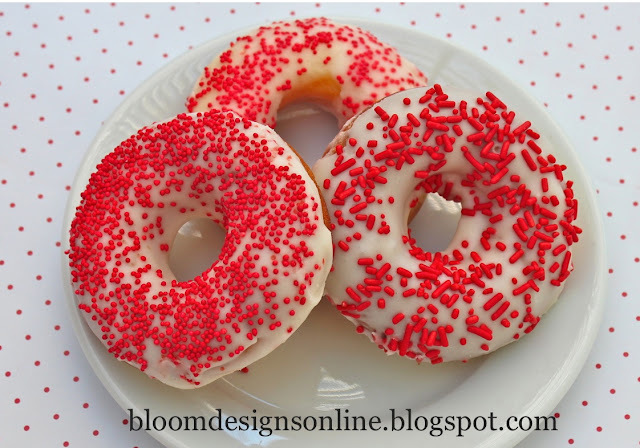 Let donuts cool slightly and then top with glaze and sprinkles. Save this recipe. Wouldn't these look cute at Christmas? Or green for St.Patrick's Day? Your school colors for the first day back to school? The list goes on and on.. They look great!!!! I have been wanting to try to make these for a while...I guess it is time for one more type of cake pan!!!! So darn cute! Where did you get the donut pan? Crate & Barrel used to make one, but it was sold out when I tried to buy it a couple of years ago. I love this idea! so cute!!! i'll have to look for the donut pan!! How fun and festive! I tried making donuts with my 3-year old today (yeast kind) and they didn't work at all...bad yeast maybe? (always blame it on the yeast ;) I'll have to try again. Am going to have to give this a try! With the Diamond Jubilee coming up, red, white and blue is the way to go for us Brits! Thing is, I need donuts NOW! These look so yummy! I've wanted to try making donuts for a while, and I like that you don't have to fry these. Pinning for later! Thanks for sharing. Your doughnuts look (and sound) great! 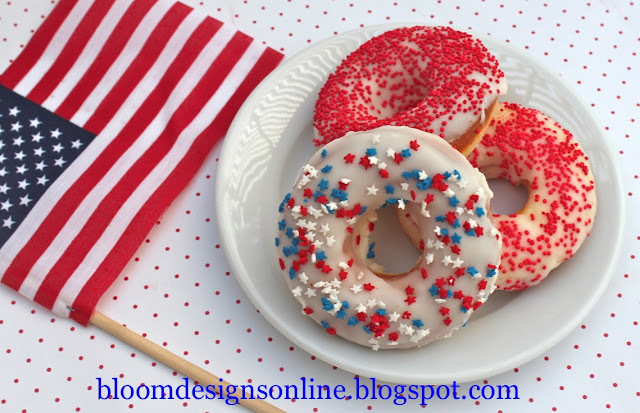 My youngest daughter and I are a bit doughnut obsessed, haha, but I've never tried making my own... maybe I'll give it a go! Where did you find the great doughnut pan? Perfect for summer and I loved that they aren't fried. These look so good! I tried making donuts a while ago, but tried frying them and they didn't come out. Baking is a much better idea! I'm featuring this tomorrow! Save your oil by clarifying it with a few thick slices of raw potatoes tossed into the hot fat until they’re browned and well done.